“Our Service of Remembrance is always an exceptionally proud and moving service. The school truly steps up to the mark and the behaviour of the pupils is always absolutely impeccable – you can hear a pin drop during the two minute silence such is the level of respect” James Lascelles, Headmaster. King Edward VI Grammar School Combined Cadet Force (KEVIGS CCF) lined the pathway to St James’ Church as a 1000 members of the school community passed through the doors of St James to listen to the school’s annual Remembrance Service. The KEVIGS CCF allows students at King Edward’s to train with the Army and Royal Air Force giving them unprecedented opportunities for leadership training. The CCF recently received an outstanding inspection report, confirming it status as one of the highest performer in the country. Once inside the Cadets lined the church and filled the choir stalls. The annual service is a core part of the school’s commitment to the Armed Services, the Church and to peace and diplomacy. The service remembered those from the King Edward’s community who fell during World War I and the roll of honour was read out during the service to ensure that the names of those who fell are not forgotten. 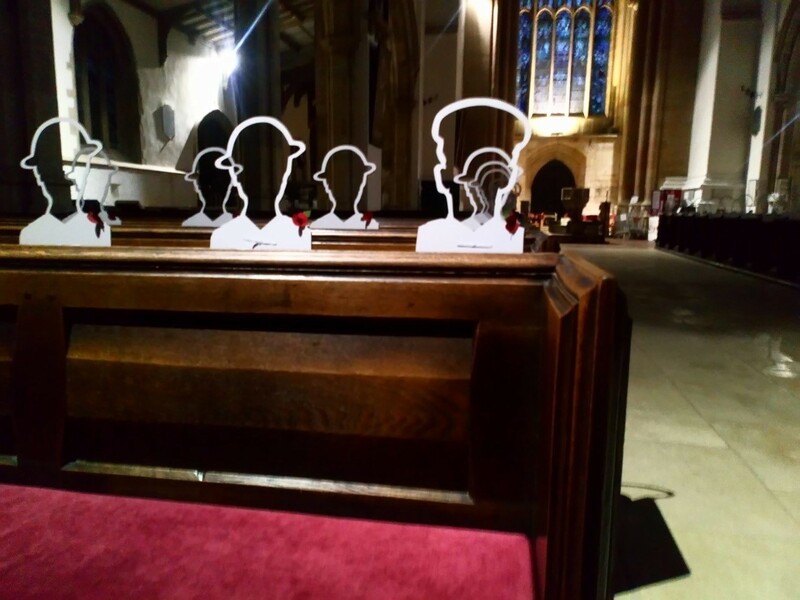 This year to mark the 100th anniversary students used the schools laser cutter to create 55 silhouettes of soldiers to recall the former pupils who had fallen in the Second World War. These were dotted around the church and members of the CCF stood beside each one and echoed back the name of their solider as the name was called out from the roll of honour: it was an incredibly moving experience for all concerned. The two minute silence for the fallen was broken not by the usual bugle calls that the school has traditionally used every year but by the haunting voices from under the church spire of the senior choir singing a piece composed by Douglas Guest called For the Fallen. The Service concluded with the singing of the National Anthem and prayers for the fallen before the Headmaster and guests returned to a smaller ceremony held at the school in the old hall which has it’s own memorial board to the fallen of King Edward’s where every year a smaller, more intimate service is held after the St James service.